How to wash kitchen towels from stains? The accuracy necessary for the correct use of kitchen utensils. Potholders should be used for hot dishes, Cutlery surface to wipe certain rags, and a towel to use for Cutlery. A separate towel in the kitchen a must have for the owner, you will need it in the cooking process. Family members must accept the rules of the hostess, and then stains from tea, chocolate and oil will not get on the surface of kitchen towels. If all are to be neat, to wash kitchen towels have much less. After each use on the surface of the towel appears bacteria that positively thrive in a humid environment. 1-2 times per week kitchen towels to use. 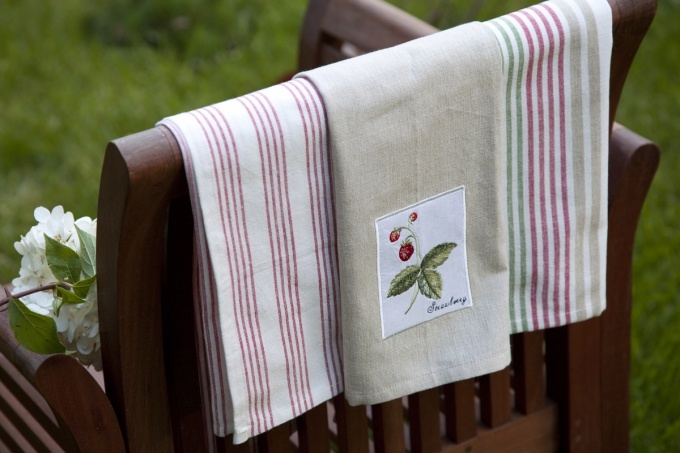 Fresh stains on fabric is much easier to wash. Bamboo, linen and cotton towels will be a great helper in the kitchen. Using modern technology it's easy to do, just download them in the washing machine and choose corresponding mode. The use of stain removers is considered irrational. To spend money to get rid of stains on a towel that can not every housewife. 1. You will need soap and a plastic bag. In the evening a wet towel carefully rubbed with soap and left in the package until the morning. You must ensure that the package was tightly tied. The next day will just have to put it in the washing machine and washed in normal mode at 60°C. 2. To get rid of the grease stains will help jirorastvorimae a tool that is in every kitchen. Some of the liquid for washing dishes on the spot, and the next day you can carefully wash. Grease stains will disappear without a trace. 2/3 Cup of washing powder for the machine-gun. Let's not be afraid of the presence of oil, it will show itself as a tenderizer when you remove dirt, so to neglect them is not necessary, otherwise the result of such a procedure will be zero. All of the components necessary to sleep in a bucket of boiling water, gently stir and add the towels. Bucket top need to be closed to preserve the heat. Soaking produce better at night and in the morning rinse the towel with water. To fill them in a bucket of boiling water, put towel, and after half an hour can be taken out for rinsing clean kitchenware. 2. In equal proportions to prepare a mixture of soap previously rubbed it on a grater, and baking soda. Mix add hot water, put the towels and boil for 10-15 min. 3. Washes kitchen towels, gets them snow white and disinfects dry mustard, which is diluted to a thick cream with warm water and applied on the entire surface of the towel. Hours through 5 towels need to rinse and wash.
No need to spend extra money on all kinds of means to whiten and remove stains, it is better to use components that always have on hand.